As far as an influence on modern metal, metalcore in particular, Dark Tranquillity are a band that can certainly lay claim to much of it. In the early 90s, alongside At The Gates and In Flames, they were imperative to the foundation of what would become melodic death metal. While having albums like The Gallery (1995), an excellent slabs of melodic death metal, recent albums have seen Dark Tranquillity become samey and in parts, tedious. Previous album, 2007’s Fiction was by no means a bad record, merely petering out in sections but still delivering some belters like ‘Focus Shift’. And We Are The Void treads much along the same line. Opener, ‘Shadow In Our Blood’ commences with Martin Brändström’s interlacing keyboards, some crystal clear lead riffing and Mikael Stanne shredding vocals. This leads on to ‘Dream Oblivion’ which was released prior to the album, and strides in familiar territory. Whereas ‘The Grandest Accusation’, works from its title and makes some splendid and grand gestures with the keys becoming particularly prevalent, however Stanne’s guttural vocals remain untouched. Meanwhile, ‘The Fatalist’ punishes with a vicious hook and ‘At The Point Of Ignition’ delivers equal results, with the latter exhibiting some striking guitar work. Although conversely ‘Her Silent Language’ is a swift jaunt with fluent layering and gliding harmonies. But bringing things to a close is ‘Iridium’, by far We Are The Void’s standout track, stretching out with beautiful samples, shifting clean/harsh vocals and slick guitar work. 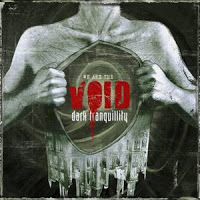 But with all said and done, We Are The Void sticks rigidly to the old beaten Swedish path, and Dark Tranquillity may very well be at risk of falling behind their followers. This offering, however, is a satisfying one just not offering anything new though. But its production is pristine and stands up sturdily but content wise Dark Tranquillity are flogging a near dead horse.